This week, RENEW wrapped up our third round of Solar for Good funding. We are happy to announce that this will be our most successful funding cycle to date! RENEW received applications from 39 nonprofits and we plan on funding as many as 36 projects. Altogether, these grants will result in as much as $4.5 million in new solar investment, totaling 2.13 MEGAWATTS of clean, renewable, solar power. This round of funding also featured our most diverse group of applicants to date. We approved solar grants for organizations ranging from K-12 schools to low-income housing to animal shelters. Proposals came in from across the state, from Washburn to Milwaukee, Dodgeville to Green Bay, and nearly everywhere in between. This fall 2018 round builds on the Solar for Good success from prior rounds in the fall of 2017 and spring of 2018. 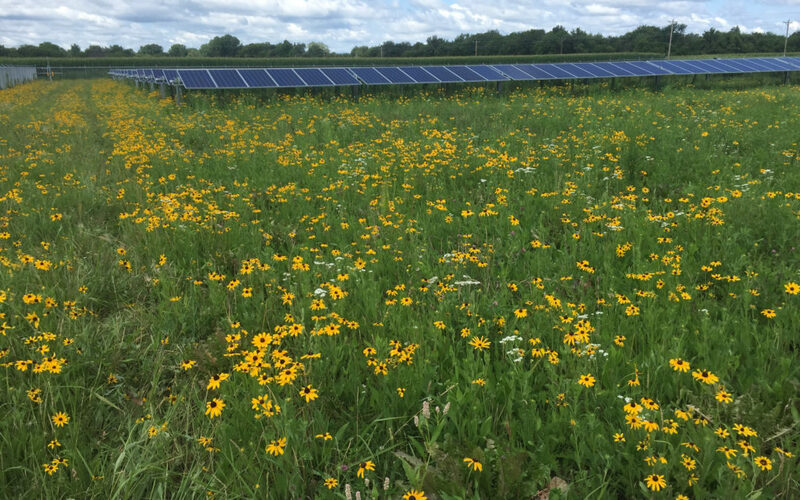 During the first and second funding rounds, RENEW issued over $200,000 in grants, helping 23 Wisconsin-based nonprofits invest over $1,677,000 in new solar projects. These projects totaled 730 kilowatts…enough to power approximately 150 homes. RENEW would like to extend our gratitude to Cal and Laurie Couillard, founders of the Couillard Foundation which funds Solar for Good. 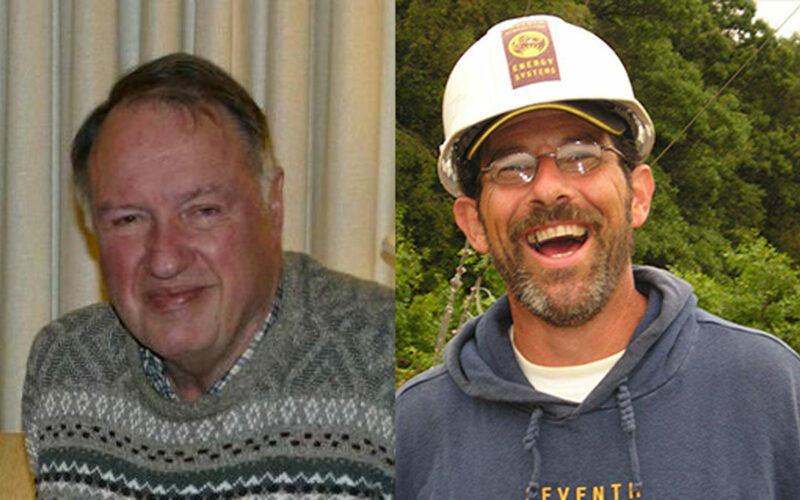 Their generosity and devotion to renewable energy has spearheaded the opportunity to expand solar in tremendous ways. 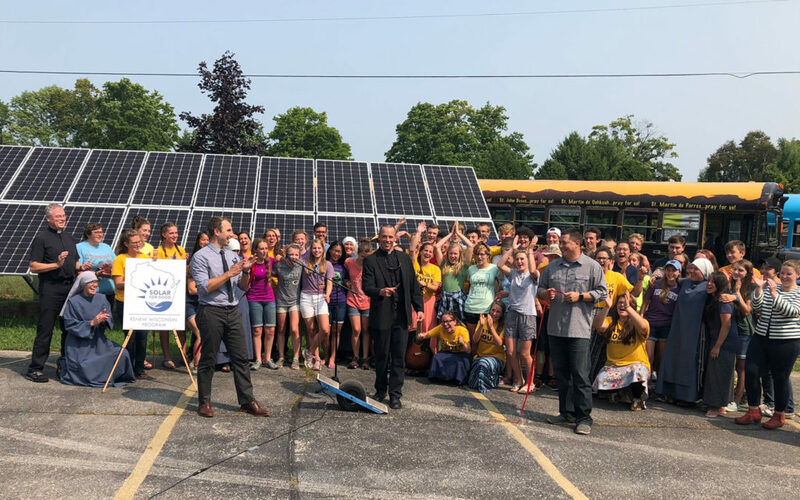 Through Solar for Good, solar power in Wisconsin is developing incredible momentum that we plan on build on in the coming years. 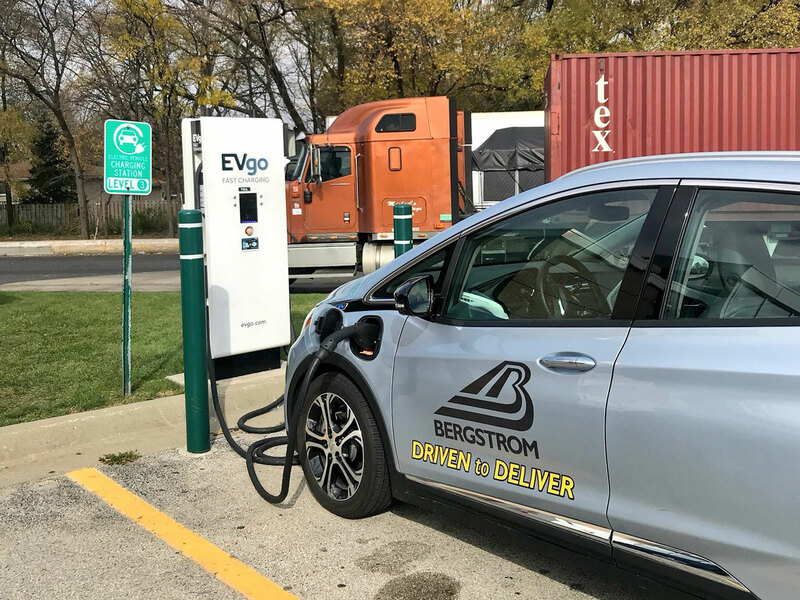 Last weekend, I drove Bergstrom Chevrolet’s all-electric Bolt from Madison to Detroit, and back. Over 1000 miles, through 4 states, in sun and snow, the Bolt and I spent a lot of time together. Hopefully you saw some of the updates on Twitter! The Bolt has a range of 230 miles in perfect conditions. That means if it’s not cold and you’re driving carefully in the city you can get over 200 miles on one full battery charge. Unfortunately, it was in the 30s and I was mostly driving interstate highways, so 200 miles on one charge was not an option. I planned my stops assuming I could get about 150 miles per charge. I set off at 7:30 on Thursday morning, charged up to 80% from a pit stop at an EVgo fast charger in Monona. After about 2 hours and 120 miles, I stopped at the Woodfield Mall in Schaumburg, just outside Chicago to charge at another EVgo fast charger. After 45 minutes of checking emails and walking around the mall, I got a text from EVgo saying my charge was complete. I set off to my next stop: the Lincoln Oasis in South Holland, Illinois, which was about 50 miles away. The Bolt’s battery wasn’t drained yet but there aren’t many fast chargers on the west side of Michigan, so I wanted to have as much charge as possible before leaving Illinois. This turned out to be a good choice. Inside the Oasis, I ate lunch and worked, and packed up 45 minutes later when I got the text that my car was charged up. My next stop was in Kalamazoo, Michigan (where I was born!) to charge at a fast charger at a car dealership. Unfortunately, this fast charger was out of order, and it was the only one within 50 miles. Turns out the charger is brand new – it was just installed at the dealership for the launch of the Jaguar I-Pace all-electric car. There was a part recall that meant it was not working yet. Bummer. But, the dealership was very gracious, they let me use their level 2 charger for free and even invited me inside for a cup coffee and to use their lobby’s Wi-Fi. I hung out there for about 2 hours which added 40 miles to the battery. At this point, I had 200 miles under my belt and had charged at 3 fast chargers and 1 level 2 charger. At 4:30pm, I left the dealership with 70 miles on the battery and a better understanding of the realities of taking an all-electric car on long road trips. Next stop, Grand Rapids, which is about 50 miles north of Kalamazoo. My plan was to pick up my sister, who lives in the area, and quickly plug into a fast charger before heading out to Detroit. The only fast charger in Grand Rapids is also at a dealership, and also affected by the part recall. So, with 20 miles left on the battery, my sister and I resolved to get dinner and spend the night at her apartment with the Bolt plugged into a level 2 charger overnight. No harm, no foul! I was disappointed I couldn’t do the drive in one day, but knew it would be an easy 150 miles from Grand Rapids to Detroit in the morning. On Friday morning, we woke up to the first snowfall of the year! 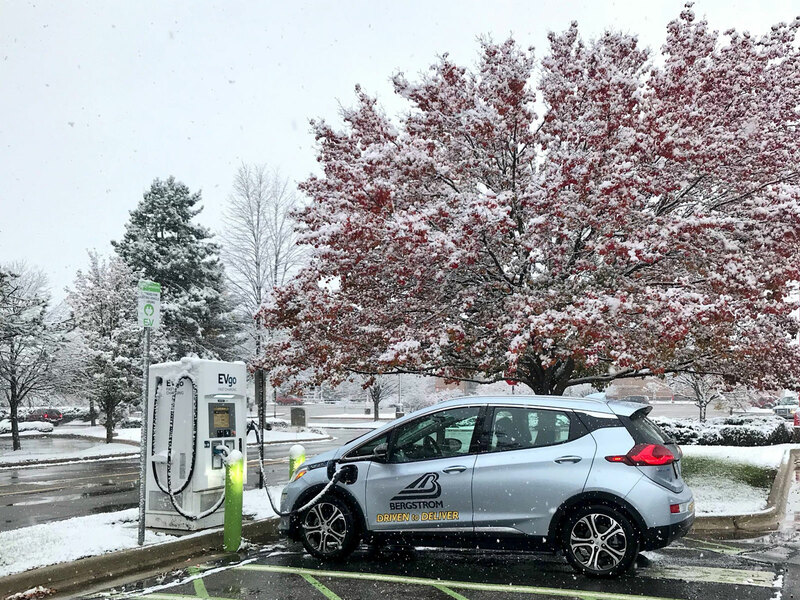 Together, my sister and I drove from Grand Rapids to Detroit, and stopped to charge up in front of a beautiful, snow-laden fall tree. I made almost the exact same stops on the way back. Creature of habit, no? It was an easy drive and actually much quicker because I didn’t stop to charge at the level 2 in Kalamazoo. I took a shorter way from Grand Rapids to Chicago, which avoided Kalamazoo entirely. Live and learn. So, 1000 miles later, my conclusions? It’s totally doable to take an electric car on a road trip. This was a far cry from the fastest I’ve driven from Madison to Detroit and back but it was enjoyable. The Bolt is fun to drive and I had an excuse to stop along the way which meant I could walk around a get a real meal instead of being confined to a car for 7 hours straight. With that said, for now, I suggest renting a car or using a plug-in hybrid if you’re short on time. Get an electric car to use around town and rent a car for longer trips. You’ll still save money in the long run, too. EVgo chargers rock. They all have human names, like “Paul” and “Stewart,” which I stopped at, which is fun. More importantly, they are easy to use and charged the Bolt within 45 minutes. Also, EVgo provided us a $60 credit so all of my charging was free! I didn’t use that to inform my charging decisions though, EVgo just had the most convenient locations. Thanks, EVgo. As always, there’s more work to be done! The network of DC fast chargers in the Midwest is growing, but it’s not where it needs to be for convenient long road trips. 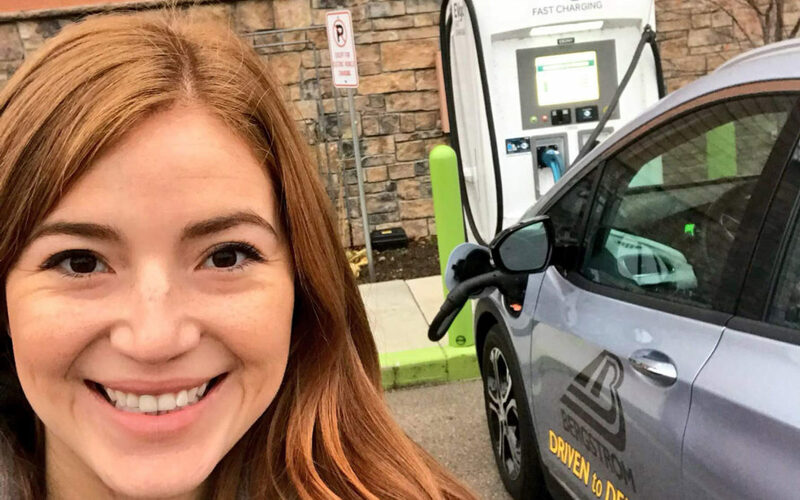 We need to work with other Midwest states to create a better network of charging stations in convenient locations so we don’t have to think twice about using an electric car for a road trip. Luckily, Volkswagen funding is available to do just that. I really dislike driving my gasoline car now. After driving the Bolt for almost a week, my car screams “inefficient.” It bugs me that when I slow down the energy is lost instead of regenerating the battery, and the delay between pressing the gas and actually moving forward seems more obvious now. What are you driving to your Thanksgiving celebrations? If it’s electric, take my virtual high-five, and a challenge to get at least one family member to drive your car around the block to see how great it is. For the rest of us driving gasoline cars, here’s to future years where we’ll be the ones showing off our electric ride. Happy Thanksgiving! A special “Thank You” to Bergstrom Chevrolet for letting us use their Bolt. Recent polling showed that the race for Governor was going to be close, and they were right! Not until a large number of late arriving ballots came in from Milwaukee did it become clear that Tony Evers was the projected winner in a hotly contested race. As of this morning the Walker campaign has not conceded the race as they look into the late reporting from Milwaukee and a few other reported ballot problems. According to the Milwaukee Journal Sentinel, Evers has a 30,849 vote lead, which is 1.18% ahead of Walker. Walker’s campaign can only request a recount if the election results are under 1%. Assuming the results hold up, Evers will take office in January. Even though the GOP retains full control of the legislature, Evers will control the State agencies and has the ability to veto anything that the Republicans in the legislature send to his desk that is not agreed to. Of particular interest to the renewable energy industry is the effect of the elections on the Public Service Commission. Because the PSC has staggered 6-year appointments, control of the PSC will not switch to Governor-elect Evers’ appointees immediately. This is different than state agencies like the Department of Natural Resources or Department of Administration, where Mr. Evers’ appointees will take control when appointed and confirmed by the State Senate. Governor-elect Evers will appoint a new PSC Commissioner, which also must be approved by the State Senate, for a 6 year term which will start on March 1, 2019. It is customary and likely that this individual will become the Chairperson of the PSC. Evers would appoint another PSC Commissioner to start a term on March 1, 2021, at the end of Commissioner Mike Huebsch’s term. Current Chairperson Lon Roberts’ term goes to March 2023. If either of those individuals choose not to complete their term on the Commission, then Evers would select the replacement for the duration of the respective term. In an even closer race, Democratic candidate Josh Kaul has a lead of 22,673 votes, or .87% over Schimel. If this holds up, it would be within the 1% threshold for a candidate to be able to request a recount. In spite of the statewide races for Governor, Attorney General and US Senate going to the Democrats, the Assembly Republicans appear to have maintained their strong 64-35 majority for the 2019-20 legislative session. One Assembly seat is close enough at this time that a recount may occur. It is between Republican State Treasurer, Matt Adamczyk, and Democratic candidate Robyn Vining. At last count Adamczyk had a 21-vote lead with all precincts reporting. With 4 to 5 Senate Republican races expected to be close, many thought that they would lose one or more seats in a year that had hints of Democratic momentum. Instead, the GOP actually gained 1 seat when Andre Jacque (R) retook the 1st Senate District seat from Caleb Frostman (D). Frostman took the seat away from the GOP when he defeated Jacque in a special election earlier this year. These results increase the GOP’s net majority in the State Senate to 19-14 for next session. The GOP held the majority in the U.S. Senate last night, but Democratic incumbent U.S. Senator Tammy Baldwin easily won reelection against Republican challenger, State Senator Leah Vukmir. Baldwin held a 10 point margin – 55-45% – as of this writing. Other than Congressman Paul Ryan, who did not run and is retiring from the House of Representatives at the end of this session, all of the congressional incumbents won reelection. Republicans maintained control over 5 of 8 congressional districts in Wisconsin. Republican candidate, Bryan Steil (CD-1) held Speaker Paul Ryan’s seat for the Republicans. 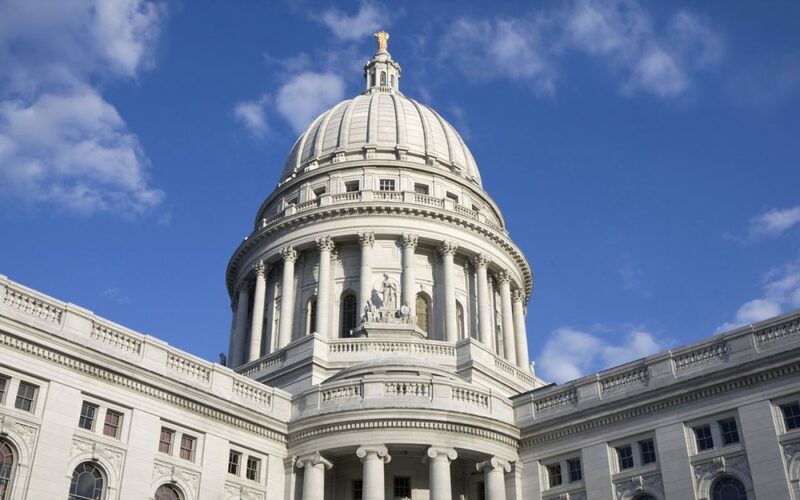 RENEW Wisconsin will be actively engaging with the Governors’ office and legislature over the next few months to start developing policy initiatives that will advance renewable energy next year.